In his closing remarks at the Symposium, José Graziano da Silva, Director General of the FAO, said that: “Today a Window was opened in what for 50 years has been the Cathedral of the Green Revolution.” The delegation of La Via Campesina, that participated in the Symposium, welcomes this opening, but recommends caution, given the attempts to coopt agroecology that were observed at the event. According to La Via Campesina, the science, practices and movement of agroecology are the product of centuries of accumulated peasant and indigenous knowledge, knowledge of how food was produced for humanity since long before farm chemicals were invented. This knowledge has been organized through a ‘dialog of knowledges’ (dialogo de saberes) with the western sciences of ecology, agronomy, rural sociology, etc. Support for agroecology, among rural social movements, consumers, environmentalists and others, has grown a lot in recent decades, in part because of it’s sharp critique of, and it’s alternatives to, the badly-named ‘Green Revolution’ of industrial agriculture. For La Via, peasant agroecology is a fundamental building block in the construction of food sovereignty. Governments and institutions, the majority of which respond to the interests of national and transnational agribusiness, have resisted agroecology. 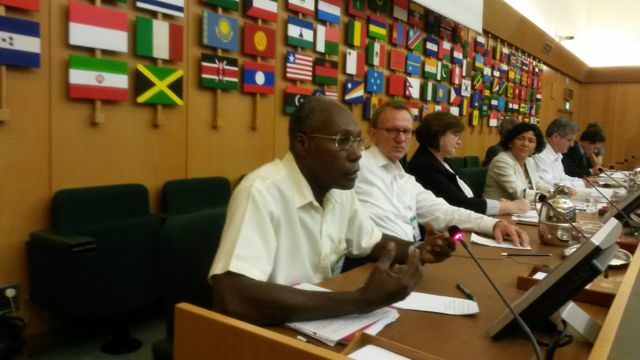 In fact, to speak of the alternatives embodied in agroecology, has until now been taboo in institutions like the FAO. Still, this situation has been changing of late, though only partially. The rapid degradation of soils and other productive resources brought about industrial farming practices, and climate change, have now created growing uncertainty about the future of industrial agriculture. And the number of scientists with studies and data that show agroecology to be a superior approach, in terms of both productivity and sustainability, is growing. The result has been more institutional opening to agroecology. But the opening is relative. While social movements like La Via Campesina see agroecology as the alternative to industrial agriculture, and highlight it’s potential help in transforming grim rural realities, the new institutional opening is geared more toward a scaled-back version of agroecology. This version is limited to seeing agroecology as nothing more than the source of a few new tools for the toolbox of industrial agriculture; in other words, of methods to reduce the negative impacts of industrial farming practices on future productivity. Those who promote this shrunken approach use names like ‘sustainable’ or ‘ecological intensification,’ or ‘climate smart agriculture,’ to refer the erroneous idea that agroecology is compatible with large extensions of industrial monoculture, pesticides and GMOs. For La Via Campesina, this is not agroecology, but rather is a blatant attempt at cooptation, which should be denounced and resisted. A decent sized delegation from La Via attended the Symposium at FAO, with delegates from Mozambique, India, Haiti, Cuba, Brazil, Mexico, Nicaragua and Italy. Three of the delegates were speakers. The delegation arrived expecting the worst, ready for a pitched battle against the cooptation of agroecology. The reality was actually somewhat more refreshing, as the majority of the scientists who were invited as expert speakers, presented visions of agroecology that were quite similar to the vision of La Via. They pointed to agroecology as an alternative, for transformation, and highlighted it’s social, political, economic and cultural contents, in addition to the technical content. This left the tendency toward cooptation as a minority position, though it was present, and evident. agroecology is based on a dialog of knowledges, and thus must continually link science with peasant knowledge, innovation and practices. support for the efforts by rural social movements to bring agroecology to a territorial scale.